At the beginning, the area where you can build your city is rather small. The City Map is an area divided into tiles, that looks like a square grid and where you can place your first buildings, in order to start your city's development. 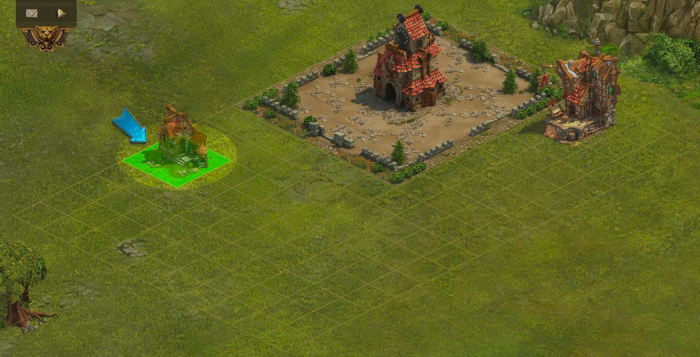 You start with 15x10 tiles (the equivalent of 3x2 Expansions). But of course your goal is to expand, and your biggest challenge is to make the best of the space at your disposal. To enlarge your buildable area you will need Expansions. Each Expansion adds a buildable area of 5x5 tiles to your city. You have three ways of getting Expansions: you can unlock them in the Research Tree (City Expansions), gain them by completing all Encounters in a Province (Province Expansions), or buy them as Premium Expansions. You can find your Expansions in the Buildings Menu. City Expansions - You can unlock these Expansions by researching the respective technologies in the Research Tree. For this Expansion category you will need: Coins, Supplies and Goods. Once they are unlocked, you will need Coins to place them or alternatively you can pay for them with Diamonds (Premium). Province Expansions - You will receive these Expansions as a reward, when you complete all Encounters of a certain amount of Provinces, on the World Map. 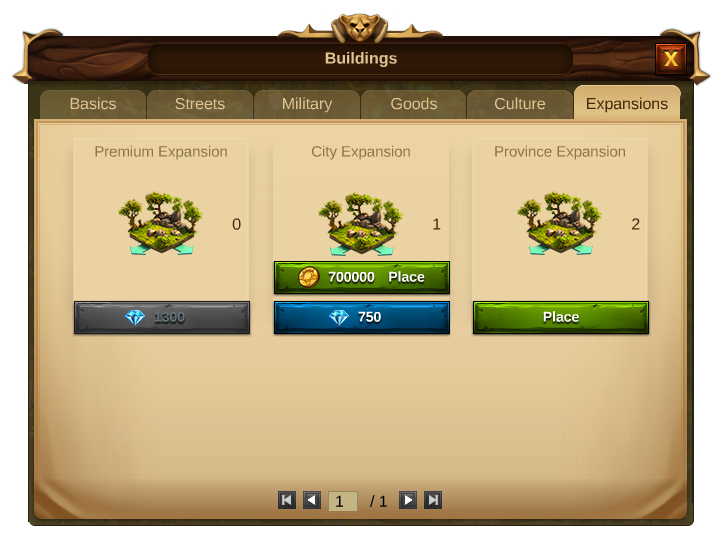 A tooltip in the Buildings Menu, on "Province Expansion", will show you how many “Completed Provinces” you have and how many are “Required for the next expansion.” No Coins or Diamonds are needed to place Province Expansions. Premium Expansions - These can only be paid for with Diamonds and they are strictly limited! You can have up to 31 Premium Expansions to enlarge the available construction area in your city. Each game segment will allow you to Research a certain number of Expansions, after unlocking them, you will need Coins to place them or alternatively you can pay for them with Diamonds (Premium). When you complete your first Province, you will be rewarded with 1 Expansion. However to get the next Expansion, you will need to complete 2 more Provinces. To get the third Expansion, you will need three more Provinces, which means you have completed 6 Provinces in total, at this time. For now, you will be able to get a total of 60 Province Expansions. Right from the start, you will have a total of 33 Premium expansions at your disposal to place in your city. This page was last modified on 13 April 2019, at 15:18.